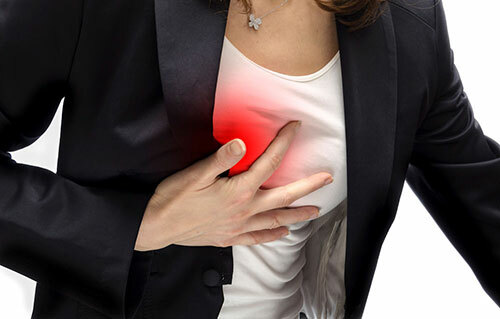 When people suddenly experience severe chest pain, the first thing that comes to mind is heart attack, which is medically known as myocardial infarction. However, there's a dangerous type of heart attack that is not accompanied with any pain and is unnoticeable. This condition is known as "painless heart attack". Myocardial infarction is a heart disease that needs to be treated as early as possible to prevent further complications and sudden death. If it won't be possible for you to identify heart attacks if it occurs without pain, then the condition may eventually become irreversible. Therefore, being able to recognize signs and symptoms of painless heart attack is crucial! Fortunately, there's one "signature" symptom that occurs in the body when heart attack occurs, which can help you identify it even in the absence of pain. This knowledge is vital as it can possibly save lives. In this article, we'll let you know how to recognize a painless heart attack and why it occurs, plus information on other diseases that can cause chest pain symptoms. When heart attack occurs, the pumping function of the heart is reduced drastically, and the amount of blood sent to the whole body decreases. Because of this, blood vessels around the body contracts and blood will flow preferentially to more important organs such as the heart or brain. Aside from the blood vessels, the sweat glands will also shrink. At this point, the body is experiencing pathological stress, and sweating may occur even in the absence of heat and movement. This is known as cold sweat (diaphoresis). Dizziness, fatigue, and facial paleness, are other symptoms that may indicate that blood circulation is insufficient and can be a sign of heart attack, too. How can a heart attack become painless? Sensory nerves can get damaged and prevent pain signals from being relayed to the brain. Diabetes and aging are the major factors that can cause abnormalities of the sensory function. Currently, the survival rate of heart attack patients who are quickly brought in for treatment is more than 90%. This shows how important it is to seek medical attention within 2 hours after the onset of heart attack. 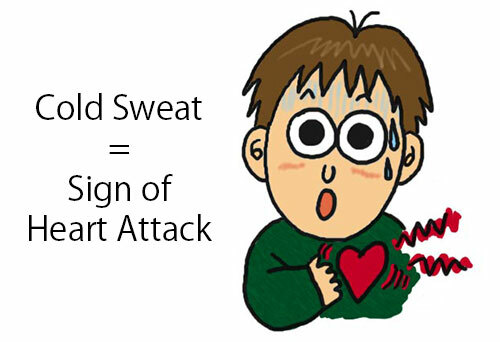 For elderly people and diabetics in particular, it is crucial not to miss any symptoms of the body especially when cold sweat occurs suddenly with no apparent reason. Is the "Chest pain" I'm experiencing something to be worried about? It doesn't always mean that a severe chest pain indicates a heart disease like myocardial infarction. Sometimes, chest pain may indicate gastroesophageal reflux disease, wherein the gastric acid flows back into the esophagus. This is more commonly known as acid reflux or heartburn. Because the severe pain is felt around the heart area, it is commonly mistaken to angina pectoris or heart attack. Still, chest pain can be caused by many other diseases aside from heartburn. Although chest pain can be difficult to identify even for doctors, one guide that can help tell whether the chest pain is life-threatening or not is by pressing your finger on the painful site. If you can locate the painful area with your finger...then it is most likely a sign of muscle pain, neuralgia, or inflammation of some sort in the chest area. On the other hand, if you are unable to locate the painful site...then the chest pain may be caused by life-threatening conditions such as myocardial infarction or heart attack, angina, aortic dissection, and pulmonary thromboembolism. It is recommended that you seek medical attention immediately as soon as these symptoms appear. A transplanted heart beats at about 100-110 per minute compared to 70 beats in a normal heart. Also, a transplanted heart does not increase its beat rate as quickly during exercise. An individual is more likely to have a heart attack on Monday morning. This is because according to research, Monday is the most stressful work day of the week. Heart attack is different from sudden cardiac arrest (SCA). Heart attack occurs when blood flow to the heart muscle stops because of sudden blockage of a coronary artery. A sudden cardiac arrest occurs because the heart suddenly stops pumping due to an electrical activity problem in the heart. 1. "Three Bags of Green Tea a Day Can Cheat Heart Attack"